Lifetime's Game of the Week in week 7 saw Orlando Pride get their first-ever franchise win over the Portland Thorns FC. The Orlando Pride went west for Lifetime’s Game of the Week to get their first franchise win over Portland Thorns FC. Orlando had two early goals, Portland pulled one back, but could not find a second. The Pride are now unbeaten in their last five games. Portland has done the opposite, going five games without a win. Both teams had a short turn around, playing Wednesday night where they both picked up a point each. The opening minutes of the match it was high paced back and forth. Portland had the first real chance of having a goal called back in the seventh minute because of an offside player. Kristen Edmonds drove the ball down the left side and tried to find Alex Morgan. Portland’s Mallory Weber got to it first but could not clear the ball before Morgan was there breathing down her back. Morgan was there to capitalize on the mistake as she put it far post passed Britt Eckerstrom on her right foot. Her former club’s supporters were silenced in the 11th minute, by Morgan. That was her first goal of the 2018 season. Morgan played a full 90 even after suffering a shoulder injury during Wednesday’s match. Orlando doubled their lead just ten minutes later in the 21st minute. After the ball was being battled for outside the 18 Christine Nairn ultimately came down with it and saw Eckerstrom off her line. Nairn took the volley with her left foot and made it 2-0. To add to the first half excitement Christine Sinclair scored just two minutes later in the 23rd minute. Tobin Heath recorded the assist after sending in the corner where Sinclair was able to rise above the Orlando defense and head one past Ashlyn Harris. Sinclair now leads the NWSL in goals with 5. 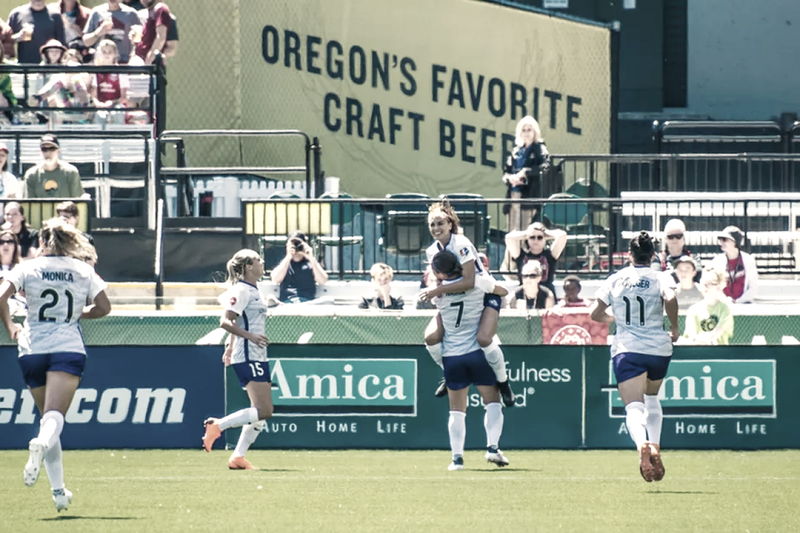 The drama continued in the second half when Orlando’s Harris and Portland’s Lindsey Horan collided in the box to have another Portland goal called back. Following that collision, Harris came up with a big save to keep the Pride on top. Portland’s Heath was in the box with some space so she fired off her right foot forcing Harris to make a diving save to her left. That would be one of Harris’ five saves on the match. Portland has struggled without having Adrianna Franch in goal. Franch has been out with a meniscus tear since late April. The Thorns have played four games without the 2017 Goalkeeper of the Year, going winless in all four. Franch’s timeline was four weeks, which means she could miss at least one more match if recovery is going as planned. The Thorns have given up seven goals in her four-game absence, as opposed to the four they let in in the four she has started. The Thorns look forward to having Franch back in net to stop some goals and put the Thorns back in winning fashion.